Despite the freezing temps and bitter winds, so many people came out to support our 3 brave kids: Gabriella, Noah, and Molly. 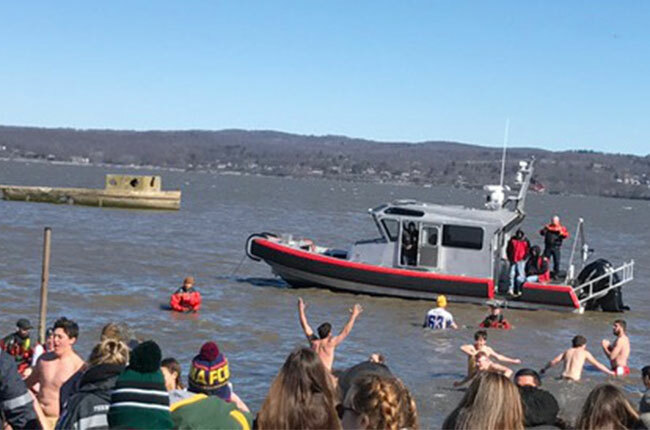 Whether you actually took the plunge into the icy Hudson River or you cheered everyone on, we wanted to thank you from the bottom of our hearts. Your support and donations mean the world to us here at the Penguin Plunge. We received so many generous donations from local businesses like Nyack Hot Bagels, Brooklyn Bread, The Strawberry Place, Rockland Bakery, Freihafer’s Bakery, and Shop Rite. This year’s Penguin Plunge was especially memorable because most of the past recipients attended the ceremony and it was a very special moment for all of us to be able to honor them. Here’s one of this year’s recipients, Gabriella Carney! Look at our awesome balloon penguin! So many people make this event possible and we try to thank every single person who contributes to the success of the Penguin Plunge! We were selling these yummy lollipops that were in the shape of penguins in all different colors! Here’s our director/ co-founder Barbara Noyes along with Molly and Gabriella and her Mom! Every year, Richie writes the name of the recipients on his chest and he leads the plungers into the water! Everyone getting ready to jump in to the freezing water! A few brave souls stayed in the water to soak up the experience! Once again, thank you to everyone who came out and supported the Penguin Plunge and our three amazing kids. We were all overwhelmed by the support we received. If you didn’t take the plunge this year, get ready for next year! Be sure to follow us on Facebook, Twitter, and Instagram for updates on more fun events!